October is Domestic Violence Awareness Month and the women at LTAI wanted to share with you some words of encouragement about this topic. In what other ways can we show support to survivors of domestic violence? Share your thoughts with us in a comment below! What message do you share when educating others? Do you have any extra tips on how to reduce the stigma surrounding HIV/AIDS? Share with us your thoughts and comments below! Click on the links to see PART 1, PART2, or PART 3! Today an LTAI member shares with us what having HIV has taught her about being understanding of others. “As a women living with HIV, I have learned a lot about tolerance and understanding. Having HIV, I have been on the receiving end of discrimination, and the stigma is always present. I know what it’s like to be judged based solely on that fact. I have learned never to judge other people because of the hurt it can cause them. I try to practice tolerance whenever I can. When you have HIV, you look at the world differently and you are more sympathetic to other people and their disabilities. I believe HIV gives me a great deal more empathy than I would normally have. It gives me strength to look at a person from the inside out, and to see them with understanding eyes. What are your thoughts about tolerance? Write us a note in the comment box!! Today is Thursday, which means it is time to Take A Stand! 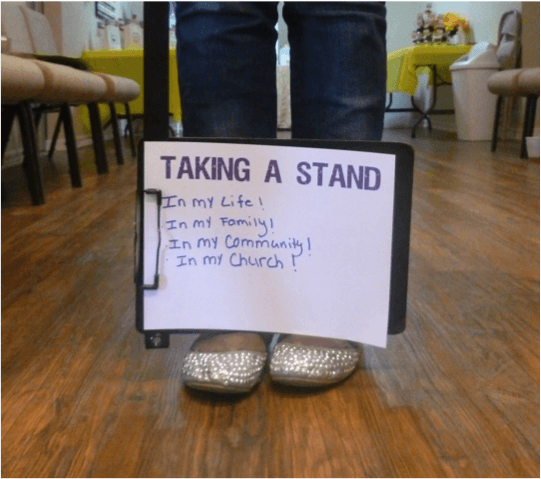 As LTAI Peer Advocates we want to remind you that Taking A Stand is something that we can do anywhere! If you have an issue you are passionate about, share it – with your family community, church and anywhere else you can think of! Advocacy is about making our voices heard and getting your message to as many people as possible! And, don’t forget, you can share how you are Taking A Stand! It’s easy–just send us a photo of your message and your feet and we’ll post your own Taking a Stand on the blog! Email photos to: letstalk@rwhp.org. Today we share a beautiful poem written by one of our LTAI blog readers, Ellen, titled “Stigma”. We hope you enjoy it and please share your thoughts and comments below! “How about a dose of dignity? All patients, especially those living with HIV, deserve to be treated with respect, dignity and kindness. Too often, women living with HIV are made to feel as though they deserve to be sick, that it is their fault for having this disease. No one should be made to feel this way, especially not by those in the medical community. Medical providers need to understand that their underlying assumptions about me- about how I got the disease, what sort of lifestyle I lead- I see those assumptions in the way they look at me, speak to me, and interact with me. From the minute I walk into the doctor’s office and speak to the receptionist, to the time I walk out that door, I deserve to be treated as a human being by each and every member of the staff, not as their assumptions dictate I am. And so do you! We need the kindness and support from our entire medical team. Remind providers to put themselves in your shoes. How would they want to be treated if the roles were reversed? We are not our illness. They need to treat us with the same dignity and respect they would want to be treated with, HIV positive or not.